At the heart of Catholic social teaching lie two principles: concern for the common good and respect for the individual human being. An example: Catholic prison ministry doesn’t dispute the need for punishment under the law to secure the safety of the public. But it also refuses to abandon the prisoner, affirms his continuing dignity and seeks his rehabilitation. To put it another way, individuals have obligations to the common good, and governments have a particular duty to provide for public security; otherwise they lose their legitimacy. But we can’t serve the common good by exploiting or callously mistreating individuals, especially the weak. Being “prolife” involves a great deal more than a defense of unborn life, though it should naturally start there. We also have grave responsibilities to the poor, the infirm, the elderly and the immigrant — responsibilities that will shape our encounter with the God of justice when we meet him face to face. Read Archbishop Gomez’s entire, excellent commentary (“On the Executive Orders”) here. Worse, the human damage has been painfully bitter: dislocated families, refugees and legal immigrants sent home or turned back, and intense fear in urban immigrant communities like Philadelphia’s. None of this is overstatement. A friend of mine tells the story of her Colombian daughter-in-law — a young woman with two master’s degrees, a recently acquired green card, legally employed, with two children by her U.S. citizen husband — who’s now convinced that she might be deported. It doesn’t matter how implausible that sounds or is; what matters is the general atmosphere of uncertainty and fear these poorly thought through, abruptly deployed executive orders have created. This in turn fuels opponents of the new administration who will use any available material to paralyze and undermine the legitimacy of a Trump presidency. Mr. Trump has now provided them with free and invaluable help. My dear Archbishop, your biggest problems with Trump’s executive orders regarding immigration seem to be that they were inefficiently issued and so confusing as to cause unnecessary fear and uncertainty. What about the fact that they fundamentally contradict and undermine the social teachings of Christianity in general, and Catholicism in particular, regardless of the degree of blunderbuss and fear-mongering at their core. Also, you seem to create a sort of moral equivalency between Trump’s heartless acts and the criticisms of his political opponents who, after all, only displayed the moral courage to stand up to his injustices. 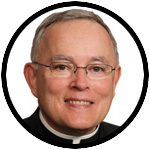 Dear Archbishop Chaput: Many of us are tired of “moral equivalency” when judging the behavior of political players in our government. As a sane Catholic, it is clear to me that Republicans have repeatedly blocked merciful immigration reform in the U.S. Republicans have consistently opposed a decent, living minimum wage. It is Republicans who have opposed healthcare as a right for all of our people. Republicans who have advocated for voter suppression in many of our states. Republicans who have advocated for endless military spending when the U.S. already spends more on the military than the next ten ranked military powers combined. Etc., etc., etc. … I don’t need to go on! Enough, please, with the “moral equivalency”. Let’s just call good “Good” and evil “Evil”. President Trump’s executive order on immigration sure has gotten much attention form the media. It is very unfortunate that the Christian genocide that resulted from the reckless regime change and usurpation of secular governments in No.Africa and the Middle East did not get much news coverage by the MSM. During the Obama presidency very few Christian refugees were accepted into the U.S, not because there was a ban, but because refugees had to go to United Nations refugee camps to be processed and Christians knew that that would be extremely dangerous for them so they remained in their communities hoping for the best. Unfortunately what they got was torture, persecution and genocide. We hear a lot about tolerance from the political left in America. But tolerance without reciprocity is suicide and Christianity is ban in very many nations, both Muslim and communist. I cannot think of one majority Christian nation that does not tolerate the open practice of Islam. And since it was the secular Muslim nations, where Christians enjoyed at least some religious liberty and safety, it was those nations that were targeted by the Arab Spring Color Revolutions, Christianity in the Muslim (once Christian) world has become victim to some of the worst religious persecution in modern times. There seems to be very little acknowledgement of the suffering of Christians in Muslim countries just as there is very little acknowledgement of the suffering and women and girls in Muslim countries and countries were Shar iah law is tolerated. The result of unbalanced assessment and reporting of all the facts concerning the plight of all refugees is hysteria and rage which is never productive. . The Church must help the people in those countries which they came from. They need to take a stronger action against the corruption in those countries. So they can stable countries. As you state in your article “individuals have obligations to the common good, and governments have a particular duty to provide for the public security.” It is the duty of the government to provide for public safety and their duty is to the citizens of the United States. Trump is doing nothing different than what he campaigned on and said he was going to do. He identified the same troublesome countries as Obama, he’s planning to build the wall that was signed into law before he stepped into office, he’s against sanctuary cities where ILLEGALS commit crimes and are protected from federal law. It’s hypocritical to start “where is the compassion” outcry depending on what party is in charge. If you want open borders with no vetting– try it in your own home. Make it an open border home. Don’t hide behind your own walls, fences, locked doors in your personal protected space. Let’s see how that works out. Look at Germany, France, Sweden– see how welcoming all who desire entrance is working out for them. Members of ISIS are serious about conversion and defeating infidels– that’s everyone who is not one of them– talk about tolerance. Where is the outcry about what they are doing– beheadings, burning enemies alive, stoning people to death? Where is their lecture on compassion? It’s sad that so many Catholics consider Pro-life as a secondary issue. A baby is innocent but there is never a lecture about choosing Pro-life first. The church is very quiet on Pro-life, marriage being between a man and a woman, etc. but very vocal on national sovereignty. When Catholic adoption agencies were shut down because they didn’t want to allow homosexual couples to adopt babies, where was the outrage and articles? Where are the “thank yous” for the promise to defund Planned Parenthood, the V-P speaking at the Pro-Life March, the push for Betsy DeVos (school choice advocate) that CatholicVote is behind? Why is national security and sovereignty a Catholic issue? I hope that’s not the case. I would really like to believe that Catholics advocating for immigrants rights or in opposition to abortion are sincere in their beliefs and not just using those issues as a smokescreen to attack a politician they dislike. There are a great many issues to be addressed in the area of immigration, but the Executive Order “Protecting the nation from foreign terrorist entry into the US” is dealing with the issue of national security, and is not addressing immigration specifically. The fact that the media is very effective in clouding the truth and stirring up insecurities is not the fault of the president; people should start reading the source document itself before panicking. (I appreciate the fact that Abp. Gomez addressed the false claim of a Muslim ban contained in the Executive Order, which is a truthful reading of the order). Just as many of us are subjected to the airport security processes that already exist in order to comply with a greater purpose of making sure travelers are safe, people ought to be more cooperative in their response to an effort by the President to make sure that the processes in place for allowing entry into this country ensure the most effective means of determining whether or not an individual is attempting to gain entry into our country for evil purposes. If a person has no evil intent, they should feel that they are doing their part to help the government protect our country and not get too concerned about the fact that we aren’t going to operate the same way we have been. To have a “business as usual” attitude would be foolish and an inappropriate response to a real concern of the American public which the Obama Administration did not address adequately. I work teaching English to new refugees, and it is a tremendous privilege. When I talk to them about Trump, and in particular this executive order, I do hear of their fears and concerns, the legitimate ones and the unnecessary ones. I am glad I am able to allay the unnecessary fears, but do see what you mean about “the general atmosphere of uncertainty and fear these poorly thought through, abruptly deployed executive orders have created.” I would say, the uncertainty and fear began during the election, and is only increased by the executive order; and the media and many Democratic refugee sympathizers are themselves only adding to the fears with their speculations and statements of woe. These dear refugees have two barriers making it hard for them to really see what is going on: the language barrier and the cultural barrier. My sense talking with the refugees I was with today is that we must pray, and pray, and pray. Pray for those who are here but are losing hope that family members can now join them; pray for our nation to let go of the hype on the both the left and the right; pray for our president and his cabinet; and for the whole world, being affected by this executive order. Thank you, Archbishop, for your words.